If you look at what NHL snipers make these days, it may seem like $30,000 isn’t very much. With players like Alex Ovechkin, Patrick Laine, and Phil Kessel using their shots to take home multiple millions every year, what’s a casual 30 grand? A fine? 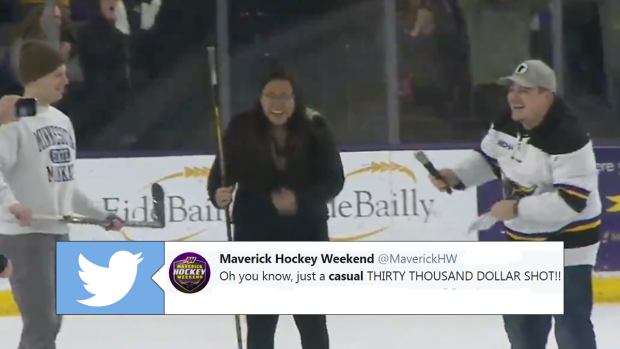 Saying that, one sniper attending the Minnesota State Mavericks game could not have been more thrilled. Using her sniping skills, Morgan Wood slid a puck from the opposing blueline and managed to hit the tiniest of targets. As a result, she was going home with her wallet just a little bit thicker. It’s fun to watch the crowd go wild as Wood becomes that much richer. Following the life changing event, Wood had this to say. In the end, she took the shot and nailed it dead centre. Cha-Ching!